Employees and volunteers of Unite 4 Humanity (the Charity) may be able to access social media services and social networking websites, either through Charity IT systems or via their own personal equipment. This social media policy describes the rules governing use of social media at Unite 4 Humanity. It sets out how staff must behave when using the Charity’s social media accounts. It also explains the rules about using personal social media accounts at work and describes what staff may say about the Charity on their personal accounts. Social media can bring significant benefits to Unite 4 Humanity, particularly for building relationships with current and potential stakeholders. However, it’s important that employees/volunteers who use social media within the Charity do so in a way that enhances the Charity’s prospects without compromising its integrity. A misjudged status update can generate complaints or damage the Charity’s reputation. For example, employees and volunteers should avoid compromising the Charity’s political impartiality, by not expressing party political views. There are also security and data protection issues to consider. This policy explains how employees and volunteers can use social media safely and effectively. This policy applies to all staff and volunteers at Unite 4 Humanity who use social media while working — no matter whether for business or personal reasons. It applies no matter whether that social media use takes place on Charity premises, while travelling for business or while working from home. The Social Media Administrator is responsible for ensuring requests for assistance and support made via social media are followed up. Unite 4 Humanity recognises that social media offers a platform for the Charity to perform marketing; stay connected with customers and build its profile online. The Charity also believes its staff should be involved in conversations with other charities/peer groups on social networks. Social media is an excellent way for employees/volunteers to make useful connections, share ideas and shape discussions. The Charity therefore encourages employees/volunteers to use social media to support its goals and objectives. Know the social networ Employees/volunteers should spend time becoming familiar with the social network before contributing. It’s important to read and understand what is and is not acceptable on a network before posting messages or updates. If unsure, don’t post it. Staff should err on the side of caution when posting to social network If an employee/volunteer feels an update or message might cause complaints or offence — or be otherwise unsuitable — they should not post it. Be thoughtful and polite. Many social media users have got into trouble simply by failing to observe basic good manners online. Employees/volunteers should adopt the same level of courtesy used when communicating via email or face to face conversations. Look out for security threat Staff members should be on guard for social engineering and phishing attempts. Social networks are also used to distribute spam and malware. Further details below. Don’t make promises without checking. Some social networks are very public, so employees/volunteers should not make any commitments or promises on behalf of Unite 4 Humanity without checking that the Charity can deliver on the promise Direct any enquiries to the Chairman. Handle complex queries via other channel Social networks are not a good place to resolve complicated enquiries and customer issues. Once a customer has made contact, employees/volunteers should handle further communications via the most appropriate channel — usually email or telephone. Don’t escalate thing It’s easy to post a quick response to a contentious status update and then regret it. Employees/volunteers should always take the time to think before responding and hold back if they are in any doubt at all. Take the discussion off-line out of the public domain. If a response is required this will be handled by the Chairman, or nominee in her absence. Think twice before sending; imagine that you’re the recipient – what would your response to the message be? This part of the social media policy covers all use of social media accounts owned and run by the Charity. Only people who have been authorised to use the Charity’s social networking accounts may do so. Authorisation is usually provided by the Chairman. It is typically granted when social media-related tasks form a core part of an employee’s job. Allowing only designated people to use the accounts ensures the Charity’s social media presence is consistent and cohesive. New social media accounts in the Charity’s name must not be created unless approved by the Senior Trustees. If there is a case to be made for opening a new account, employees/volunteers should raise this with the Senior Trustees. To listen and participate in conversations. Social media is a powerful tool that changes quickly. Employees/volunteers are encouraged to think of new ways to use it, and to put those ideas to the Trustees. Charity social media accounts must not be used to share or spread inappropriate content, or to take part in any activities that could bring the Charity into disrepute. Further guidelines can be found below. By posting about the Charity, staff and volunteers can help to build the Charity’s profile online. As a result, the Charity is happy for employees/volunteers to spend a reasonable amount of time using their personal social media accounts at work. Employees/volunteers may use their personal social media accounts for work-related purposes during regular hours, but must ensure this is for a specific reason (e.g. competitor research). Social media should not affect the ability of employees/volunteers to perform their regular duties. Use of social media accounts for non-work purposes is restricted to non-work times, such as breaks and during lunch. You must avoid making any social media communications that could bring the charity into disrepute. You should not defame or disparage the charity (which includes Unite 4 Humanity or other brand partners), its staff and volunteers or professional/charitable contacts and client confidentiality must be upheld at all times. Any such actions may result in disciplinary action up to and including dismissal. Employees and volunteers may be required to remove such content. Failure to comply with such a request may in itself result in disciplinary action. The rules in this section apply to any employees/volunteers using Charity social media accounts. Post message, status updates or links to material or content that is inappropriate. Use social media for any illegal or criminal activities. Broadcast unsolicited views on social, political, religious or other non- business-related matters. Send or post messages or material that could damage Unite 4 Humanity’s image or reputation. Post, upload, forward or link to spam, junk email or chain emails and messages. 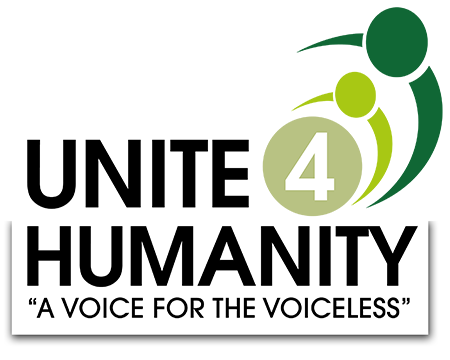 Unite 4 Humanity respects and operates within copyright laws. Users may not use social media to: Publish or share any copyrighted software, media or materials owned by third parties, unless permitted by that third party. If staff and volunteers wish to share content published on another website, they are free to do so if that website has obvious sharing buttons or functions on it. Share links to illegal copies of music, films, games or other software. Employees/volunteers should be aware of the security and data protection issues that can arise from using social networks. Share or link to any content or information owned by the Charity that could be considered confidential or commercially sensitive. This might include details of key customers, or information about future strategy or marketing campaigns. Share or link to any content or information owned by another charity or person that could be considered confidential or commercially sensitive. For example, if a competitor’s marketing strategy was leaked online, employees/volunteers of Unite 4 Humanity should not mention it on social media. Share or link to data in any way that could breach the Charity’s data protection policy. Charity social media accounts should be protected by strong passwords that are changed regularly and shared only with authorised users. Staff or volunteers must not use a new piece of software, app or service with any of the Charity’s social media accounts without receiving approval from the Chairman. Staff and volunteers should watch for phishing attempts, where scammers may attempt to use deception to obtain information relating to either the Charity or its customers. Employees/volunteers should never reveal sensitive details through social media channels. Customer identities must always be verified in the usual way before any account information is shared or discussed. Employees/volunteers should avoid clicking links in posts, updates and direct messages that look suspicious. In particular, users should look out for URLs contained in generic or vague-sounding direct messages. The Charity reserves the right to monitor how social networks are used and accessed through company IT and internet connections. Any such examinations or monitoring will only be carried out by authorised sta Additionally, all data relating to social networks written, sent or received through the Charity’s computer systems is part of official Unite 4 Humanity records. The Charity can be legally compelled to show that information to law enforcement agencies or other parties. Knowingly breaching this social media policy is a serious matter. Users who do so will be subject to disciplinary action, up to and including termination of employment. Employees, volunteers, contractors and other users may also be held personally liable for violating this policy. Where appropriate, the Charity will involve the police or other law enforcement agencies in relation to breaches of this policy.